A career as a medical transcriptionist can be incredibly rewarding. If you are interested in the healthcare industry, a medical transcriptionist position is certainly worth exploring. At Fast Chart, we hire top-notch medical transcriptionists who are passionate about helping healthcare organizations succeed. Read on to learn more about the benefits and qualifications of a medical transcription job at Fast Chart and what you can expect from our recruiting process. Medical transcription jobs come with a wide variety of benefits that are not typically seen in other industries. One of the greatest perks is the flexibility. As a medical transcriptionist, you have the freedom to set your own hours. If a 8:00 A.M. to 5 P.M. work day just isn’t for you, , you have come to the right place. You can work part-time or full-time from the comfort of your own home and save on the expenses of gas, car repairs, and business attire. Additionally, you will develop a comprehensive knowledge of the healthcare industry as well as expertise on cutting-edge technologies. This benefit could potentially aid in career advancement down the road. Fast Chart prides itself on providing our clients with rapid turnaround times and a 98.5% accuracy rate. 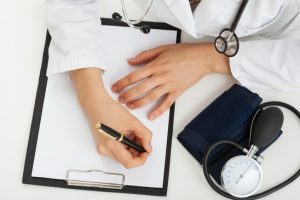 Therefore, we only contract U.S. based medical transcriptionists who are highly skilled in processing voice reports dictated by medical professionals into text format. Prior to applying for a medical transcriptionist job at Fast Chart, you must review our requirements and qualifications. If you believe that you meet our requirements, complete an online Qualification Form and attach your current resume to prequalify online. Once you pre-qualify, you will be asked to complete a few tests on typing and medical terminology. After the test is evaluated, you will receive a response within three business days.